He joined neighbors and strangers who converged on the smoldering husk of the plane, looking for survivors. Mr. Santana said charred bodies, some dismembered, were scattered across the site; some had been thrown clear of the wreckage. A volunteer rescuer spotted movement under some fallen branches: a woman’s hand. Mr. Santana and others rushed to help pull the crying woman out and get her to an ambulance. She was burned and bloodied but conscious. Mr. Santana said he also helped pull out two other people, both men, who were breathing at the time but inert. Cuban officials said three women ended up surviving the crash, though they were in grave condition. Among those on board the plane were five crew members, all Mexican. As part of its contract, Cubana hired them to operate the aircraft, an agreement known as a wet lease. As of late Friday, there was no specific mention of the crew’s condition. 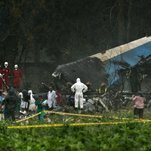 Leticia Nuñez, the sister of the flight’s captain, Jorge Luis Nuñez Santos, said that her family had only heard the information reported in the media, and had not received any further details from Mexican authorities. Ms. Nuñez said she assumed the worst, but was still waiting for official confirmation of her brother’s death. “Sometimes crew members change, someone gets in late — we don’t lose hope, we can’t,” she said in an interview over Facebook.